Philadelphia History: Early Railroad Transportation. March 24. Chestnut and Walnut Street Railway, act of legislature, approved by Council. Company agreed to pay $100,000 towards bridge over the Schuylkill. May 24. Fire, Richmond and Schuylkill River Railway (Girard Avenue Line--Palmer to Thirty-first Street.) Depot, Girard Avenue above Twenty-sixth Street. February 1. Passenger railway fares raised to 7 cents. May 13. Chestnut and Walnut Street Railway commences west of new Chestnut Street bridge. March 21. Trial of steam passenger cars on the West Philadelphia (Market Street) P. R. W. Co. Seven dummy engines were in use. April 13. Steam dummy cars, after a year's trial by the Market Street Railway Company, withdrawn from service. Too expensive. July 31. Seventeenth and Nineteenth Streets Passengers Railway formally opened as a portion of the Continental Passenger Railway. March 25. Stable of the Richmond branch of the Union Passenger Railway Company, Thompson and Norris Streets, burned. Loss, $20,000. June 24. 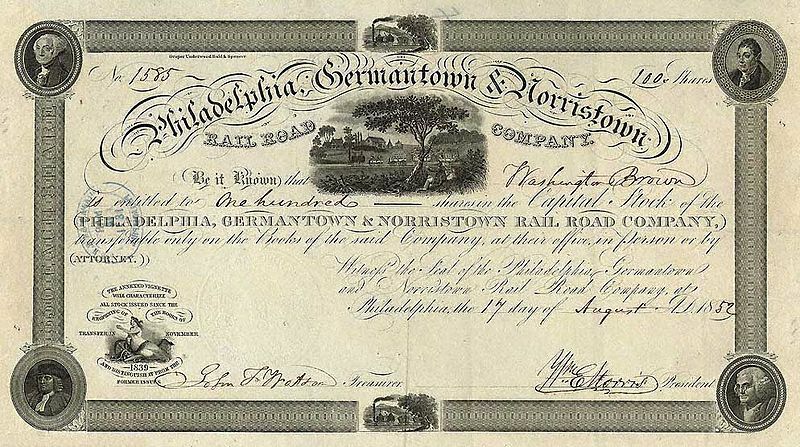 Fifteen thousand three hundred and nine shares of stock in the Germantown City Passenger Railway Company (Fourth and Eighth Streets) being a controlling interest, sold to a syndicate represented by the People's (Callowhill Street) Railway Company. March 18. Directors of the Union Passenger Railway Company resolved to adopt the cable-motor system for propulsion of their cars on Columbia Avenue branch from Twenty-third Street to East Park entrance. April 7. Cable-motor branch of Union Passenger Railway, Columbia Avenue, from Twenty-third Street to the Park, commenced regular operations. May 12. Stockholders of West Philadelphia Passenger Railway Company ratified a lease of their road to the Philadelphia Traction Company for nine hundred and ninety-nine years, on a contract to pay each stockholder ten dollars per share annually, in half-yearly payments. February 25. The Philadelphia Traction Company gave notice that on and after the first of April the fare on all lines controlled by the company would be five cents for a single ride, with privilege of transfer at certain points and additional charge of two cents for transfer at other points formerly freely given. January 10. Cable cars of the Traction Company began running on Seventh and Ninth Streets between Columbia Avenue and Mckean Street. March 1. Cars began running on the Catharine and Bainbridge Streets branch of the Philadelphia Traction Company. Coaches of the Omnibus Company General began running on Broad Street. April 1. The Frankford and Southwark (Fifth and Sixth) Passenger Railway Company took possession of the Tenth and Eleventh (Citizens Line) Passenger Railway Company. August 12. Trolley cars of the People's Traction Company began running to Mt. Airy. July 22. Leading stockholders of the People's and Electric and the Philadelphia Traction Companies agreed to consolidate and form a company with a capital of 30,000,000, a charter for which was afterwards obtained and consolidation effected, dating from October first. November 10. The Fairmount Park trolley road formally opened. March 3. The power house of the Union Traction Company at Thirteenth and Mount Vernon Streets was destroyed by fire. Loss, $400,000. Two killed and about a score injured. February 1. The Union Traction Company took possession of the property of the Hestonville, Mantua and Fairmount Passenger Railway Company. June 19. Eight or ten masked men entered the office of the Fairmount Park Transportation Company, near Belmont, after the cars has ceased running for the night, and five other employees, forced the safe and abstracted $3,355.57. Single fare 7 cents, 4 tickets 25 cents. Children under ten years, 4 cents.